so i was doing my bi-weekly mall shopping yesterday and stopped by the MAC booth in nordstrom like always, but unlike always i decided to buy something. i usually don't buy a lot of makeup in department stores. the makeup i do get that is high end is usually a gift or i get a really good deal on it. but i have been wanting to pick up cork and shroom eyeshadow as a lot of the tutorials i watch on youtube use them. anyway, as i was about to check out i spied out of my little eye some sweet ace nail polish bottles tucked away under a display. i snatched them up and grilled the sales girls for information. turns out they were counter samples and the girls were pre-selling them for an event they were having. 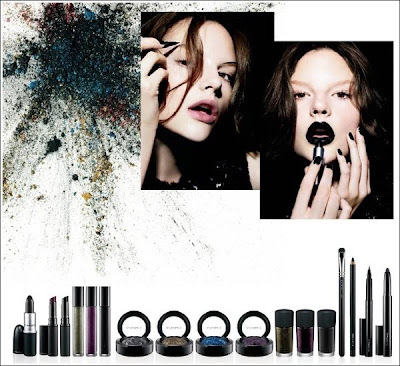 they are part of the "style black" collection MAC is releasing later this month. the ones i got are seriously hip and baby goth girl. i'll get them at the event on sept. 26. yay!! this collection looks fun and is just in time for halloween! so run run run to your MAC booths ladies and pre-order the heck outta these shades if you haven't already!